Western Capitalism Since the War by Michael Kidron – Weidenfeld & Nicolson, 36s. Theories of Imperialism by Tom Kemp – Dobson, 42s. Both these writers are left-wing lecturers at Hull University. 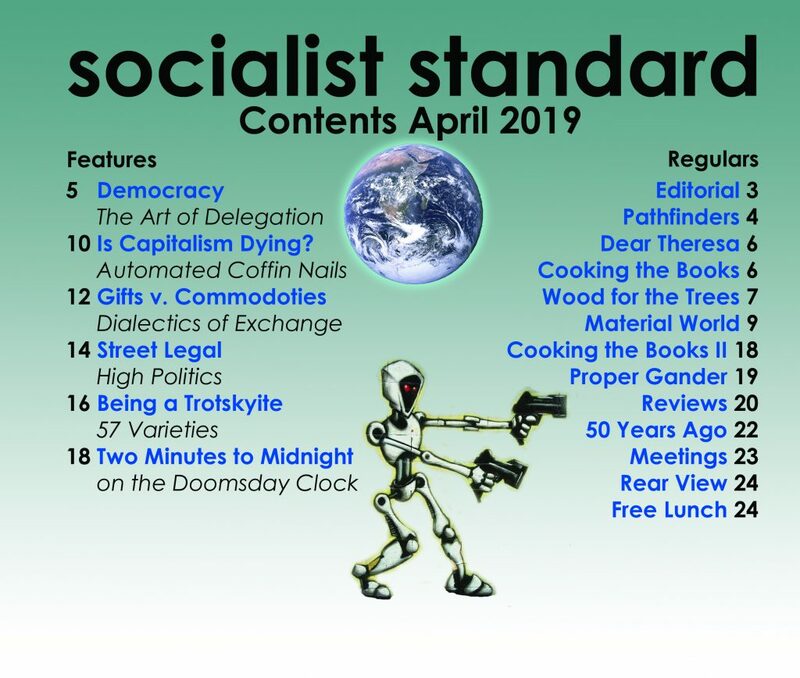 Michael Kidron is a prominent member of the ‘International Socialism’ group, while Tom Kemp is editor of Fourth International—the ‘Socialist’ Labour League’s theoretical journal. Kidron’s little book (which he rightly calls an essay) concerns itself with the economic trends which he can see, or thinks he can see, developing in Western Europe and North America. Kemp, on the other hand, has produced a commentary on the theories of imperialism elaborated by a number of writers—Lenin, Luxemburg, Hobson, Schumpeter; but the reader catches glimpses of what the SLL thinks is happening to capitalism today. Slumps and crises are a permanent feature of the capitalist system. So, for relatively long periods, it often displays a marked tendency to stability. When this happened in the 1890’s one of its effects was to lend weight to the arguments of the revisionists, led by Eduard Bernstein. 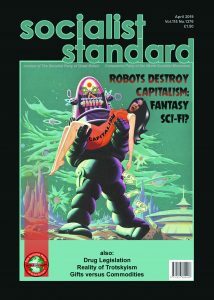 Bernstein claimed that capitalism was becoming more adaptable and was able to stabilize itself by means of the credit system, employers’ organisations and other devices. In the same way, since the Second World War, other theories have been put forward to explain the fact that no generalised slump has developed and one of the most .fashionable has been the so-called permanent arms economy. The coming period, he said, would be one of crisis and instability. The point is that capitalism docs not need a great deal of stabilising anyway— since it is not as unstable as I.S. claims. They subscribe to the underconsumption myth, that left to itself capitalism would collapse as it would not be able to sell what it produced. But, if you hold this view, you must explain why capitalism has not collapsed long ago. The answer Michael Kidron came up with was that capitalism would have collapsed had it not been for arms spending. It is true that consistency is not one of the I.S. group’s strongest points but their statement that the so-called permanent arms economy is coming to an end ought to mean that they think capitalism is about to collapse. For some reason, John Palmer did not give a date. In fact, what is collapsing is not capitalism but the myth of the permanent arms economy. It has been discredited along with Keynes generally. It is a measure of I.S.’s theoretical bankruptcy that, faced with this, they fall back on the “crisis of capitalism” to create the conditions for social revolution, rather than the growing understanding and organisation of the working class. The ‘Socialist’ Labour League, of course, never tires of telling us that the capitalist system is in a state of “crisis”. According to them, capitalism has been in this condition for years but recently it did look as though the unbearable tension (and the semi-hysteria it gives rise to in the League) might get some relief when the SLL central committee solemnly announced that the socialist revolution had started, (see Newsletter 25/5/1968). Tom Kemp, however, is relatively restrained in his book and, since he is a Trotskyist, the most interesting sections are those concentrating on Imperialism: the Highest Stage of Capitalism. Lenin came up with the idea that it was imperialism which had given rise to the opportunist trends in the social-democratic movement. As with Kidron’s theory, the Socialist Party is in fundamental disagreement with this view. In fact, we reject the Leninist concept of “bribery” as being as crudely mistaken as is the supposedly stabilising influence of the permanent arms economy. For a start, the capitalists have nothing to bribe the socialist movement with. But objections such as this are incidental in any case. The most important error Lenin and his followers made was to imagine that there was any need to bribe the working class into supporting the war effort in their various countries. The workers then, as now, were committed to capitalism. Come war or peace, crisis or slump, their support of the capitalist system has never wavered. By refusing to face up to this, Lenin contributed to the mystical belief in the revolutionary aspirations of the workers which remains a characteristic of all shades of neo-bolshevism. It is this which accounts for the obsession with leadership which is displayed by groups like I.S. and the SLL. The revolutionary potential of the working class is being diverted by right-wing labour leaders, they argue. Hence the need for alternative “revolutionary leadership”. The Socialist Party rejects this idea as well. What is needed is not leadership (the labour movement is rotten with “revolutionary leaders” as it is) but a working class equipped with an understanding of Socialism. The left wing are a valuable asset to the capitalist system, thanks to the confusion and disillusionment they produce. As a force for maintaining capitalism they are far more potent than any “bribery” or economic strategy which the ruling class, could resort to.